(AP)  Japanese seeking information on radiation levels in the aftermath of the Fukushima disaster are turning to a volunteer group founded in the U.S. that has created a detailed and constantly updated visual database online. Sean Bonner, a Los Angeles resident, computer expert and one of the founders of the group called Safecast, said nothing could have been more natural than to jump in and fill the need for information after the March 2011 earthquake and tsunami caused reactor meltdowns at the Fukushima power plant in northeastern Japan. Many Japanese were terrified about the health effects of radiation, especially for children, and worried whether their homes, schools and offices were safe. They were also frustrated by the lack of government or other official data on radiation. Geiger counters were selling out. Over the last year and a half, Safecast, billed as "a global sensor network for collecting and sharing radiation measurements to empower people with data about their environments," has grown. It has won grant funding, including The John S. and James L. Knight Foundation, has collected donations and works with Japanese universities. Local governments in Fukushima are also linking up with Safecast to get additional readings, such as in schools, and sharing data with residents. More volunteers are joining, including Europeans, Japanese and other nationalities. The latest prototype, now as small and elegant as a cellphone, is on its way to becoming a commercial product from major U.S. Geiger counter-maker International Medcom, later this year. Although the government and some scientists had radiation data, they were not as quick as Bonner to go to the Japanese people. In one case, the Japanese government kept secret its radiation projection data, which had accurately shown wafts of radiation heading northwestward from Fukushima Dai-ichi nuclear plant, far outside the neat 20-kilometer (12-mile) circle defined by government evacuation orders. That kind of secrecy got people unnecessarily exposed, including those who evacuated right into the path of spewing radiation. The secrecy and the mistrust of the government it has created in the Japanese public, along with officials prone to flip-flopping on their remarks, have helped boost Safecast's popularity. Toshikatsu Watanabe, who heads a marketing company in Fukushima, is grateful to Safecast. "When you don't know, you become afraid," said Watanabe, who has measured not only his home and office but schools and other places in his neighborhood. "I can only do what I can, and we don't know for sure if the radiation is going to have a bad effect or what," he said. "The people of Fukushima are trying to cope, day by day, and it's a long road ahead." Besides the regular Geiger counter, Safecast uses relatively simple technology. 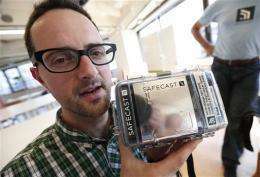 Yet Safecast filled a critical need in post-disaster Japan. And it did so simply by quick thinking and quick action, bringing people from various countries together. Safecast is careful not to take sides on whether Japan should stick with nuclear power or abandon it, to preserve its reputation for objective data, unclouded by suspicions they may be manipulated to back one side or the other. Sometimes, people who were getting ready to move found they had been unnecessarily alarmed after examining Safecast data, and stayed. With data, people can make better decisions, said Bonner. "Everything is radioactive all the time, but nobody was paying any attention to it," he said, referring to the low natural background levels of radiation present everywhere. "Most of us have no point of reference for what radiation is."